there for trivia (on a date! ), but I had to get a turkey sandwich as well. I haven’t reviewed one in a while for a few reasons. I’ve been packing my lunch pretty consistently to save a little bit of money. I’ve also run out of places nearby my office for lunch, so I’ve got to venture out when I can. I arrived at the place a little early and got in just at the tail end of happy hour. Three dollars for a pint of Grain Belt Premium isn’t too bad. My date came a little bit later and we got some food. Luckily, she knew all about the turkey sandwiches, so I didn’t have to explain everything. However, she was curious about what I thought about the sandwich. First off, it was served on caraway bread. This was a big deal. I have never had a turkey sandwich on caraway bread. As I’ve said before, the bread is the quarterback of the sandwich. If you don’t have good bread then your sandwich is already on the wrong track. The bread was thick, tasty, and it kept everything together. The sandwich was also served with lettuce, tomato, onion, and cheddar cheese. The meat was just about how I like it. It wasn’t slimy, and it wasn’t clumped together either. All in all, it stayed together well as I made my way through it. The lettuce and tomato were fairly decent as well. My favorite part of the whole thing was the cheese. It was sharp cheddar! Sharp! You don’t see too many places using real, sharp cheddar. I like places that do a simple thing really well. 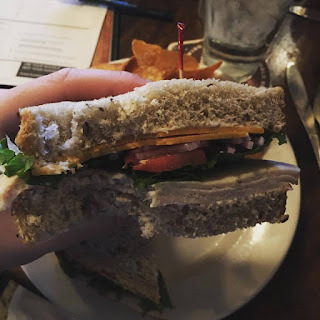 Keegan’s Irish Pub did this simple sandwich very well. The sandwich also came with a side of potato chips (“crisps”) which were a nice change of pace from the usual fries. Overall, I really liked the sandwich. I wish they served something like it closer to my office. It stayed together and tasted pretty good. It also had mustard. I’m not much of a mustard guy, but this wasn’t all that bad. I’d give it a 4.5 out of 5 because it was tasty and was a good value, but I don’t think it’d be a regular in my rotation. Also, as much as I love sandwiches, it’s not always great to eat them for dinner. I kind of wish I had a burger for dinner. This is probably a subject for another blog post. To sum up the other part of the evening. The date went really well. Nothing like a good sandwich and good company, even though we didn’t do all that well in the trivia itself.